With the release of his 1989 album Flowers in the Dirt, Paul McCartney began to resuscitate his career. Following the success of Venus and Mars and his mid-’70s "Wings Over America" tour, the legendary Beatle badly lost his way. By the early ’80s, he had begun churning out duets with the likes of Stevie Wonder and, gasp, Michael Jackson, and although the singles were hits, they were not good. It unquestionably appeared as if his attempts to distance himself from the shadow of his former group had caused him to lose touch with his history and legacy. That’s what made Flowers in the Dirt so important. In recording the album, McCartney tapped the talent of Elvis Costello, Nicky Hopkins, and David Gilmour, and though it was far from a masterpiece, it was, at least, quite amiable. More importantly, the tours that followed were his first world expositions in years, and through his concerts, McCartney reconnected with his fans by revisiting his catalog of classic songs, some of which he had never before performed in a live setting. Thus began a pattern that continues to this day — a new album, followed closely a massive trek around the globe. Each of these has been better than the last, culminating, for the moment, with McCartney’s recent magnificent excursion in support of Driving Rain, and of course, each tour has brought an array of concert souvenirs, from albums to videos. 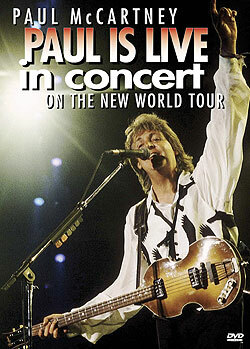 Paul Is Live in Concert on the New World Tour was pieced together from footage shot during his 1993 jaunt, which came in conjunction with Off the Ground, another likeable if less than extraordinary outing. This video was recently transferred to DVD, and though the bonus features are regrettably few — a biography and a photo gallery — it now, at least, boasts a blissful mix, fully restored and remastered in 5.1 Dolby Digital Surround. As one might expect, there is a plethora of material from Off the Ground included on Paul Is Live, and while none of the songs succeeds half as well as McCartney’s classic compositions from his days with The Beatles, he does inject some much needed energy into the new tunes, playing to the Chuck Berryisms of his animal rights anthem Looking for Changes and finding the ’50s rock swagger in Hope of Deliverance. There are two tracks from his Wings period, too — the blues groove of Let Me Roll It and the heady, mind-boggling swirl of Live and Let Die — but it’s largely The Beatles’ songs that reign supreme. On both Michelle and Here, There, and Everywhere, McCartney adds a European flair that transplants them to a Parisian café; Magical Mystery Tour travels through the mind’s eye via a vibrant, variegated wormhole of psychedelic splendor; Let It Be basks in the warm glow of its gospel resplendence; and Yesterday is, of course, as timeless as ever. Most concert documents inevitably are relegated to the bottom of the bargain bin, outliving their usefulness once the furor of a tour has passed. They live and die as souvenirs — ones that are quickly consumed and just as rapidly discarded and forgotten. No wonder, then, that organizations like Clear Channel are now attempting to put these products into customers’ before they can even find the keys to their cars. Paul Is Live harkens back to a time when these documents had to at least try to be something more. In that sense, it succeeds. It could have been simply a memoir for those who were there, and although there are moments when it seems like that’s all that it will ever be, there are also quite few nifty nuggets tucked inside.